The US has just published new data for the 2nd quarter of 2017. 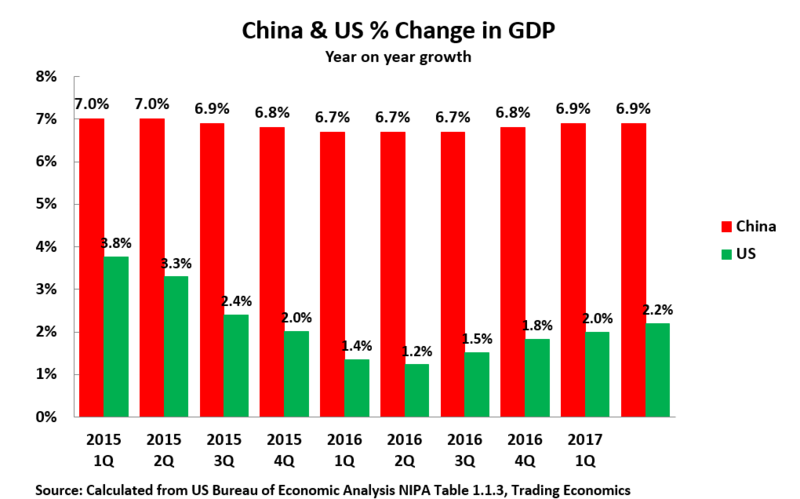 In order to accurately compare this data with China it is necessary to understand that the way the US and China publicise their GDP data is different. ​China publicises its data as a comparison to the same quarter in the previous year – that is, China’s latest 6.9% growth figure is a comparison of the 2nd quarter of 2017 with the 2md quarter of 2016.  This has the advantage that it eliminates any need to estimate a seasonal adjustment – as the same period in two different years is being compared. ​The US publicises its figure as the growth compared with the previous quarter annualised. The actual growth of the US economy in the 2nd quarter of 2017 compared to the 1st quarter was 0.75%, which the US publicises as 3.0% annualised growth. This method has a serious disadvantage as it depends on the seasonal adjustment being accurate – but it is widely known that the 1st quarter of each year seasonal adjustment in the US is inaccurate, and persistently produces the anomaly of very slow growth. If a comparison is made of US GDP for the 2nd quarter of 2017 with the 2nd quarter of 2016 US GDP growth year on year is actually 2.2% – as shown in the chart below. ​In contrast China’s economic growth in the last year of 6.9% is more than three times as fast as the US. 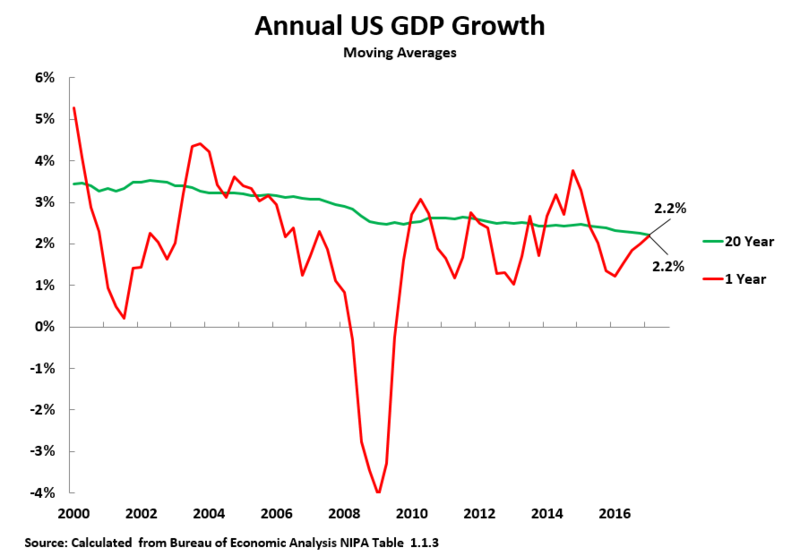 The US business cycle​In order to judge the real dynamics of the US economy it is useful to compare present growth with the long term average. The chart below therefore compares current US year on year growth with its long term average. It may be seen that the US growth rate in the last year of 2.2% was the same as its 20 year moving average. ​However, it may also be seen that in 2016 US growth was abnormally low and below its long term average – GDP growth for the whole year was only 1.6%. Therefore purely for statistical reasons of a ‘reversion to the mean’ it would be expected that US growth in 2017 would accelerate somewhat from 2017. ‘This increase will not be large enough to alter the fundamental trend of slow US medium/long term growth – which will remain at approximately two percent or slightly above. ‘This weak recovery is not enough to change the US long-term slow growth’. The data therefore confirms US long-term economic growth rate will remain at around 2% or slightly above. It is very interesting. I would like to know why you chose a 20 years moving average to calculate the long term economic growth? thanks beforehand.